Thank You for today. Often we think that it is just another day in our life. You know what? It is not just another day: it is the day that is given to us. Today is Thanksgiving. Every language in the world has a way of saying “thank you”. In English the Latin root of the word “gratitude” is “grate” or “gratis” – a given gift – and from this same root we get our word “grace”, which means a gift freely given. We all are gifted by Today. Three miraculous minutes of gratitude are visiting us to remind that we are engaged in a Miracle which we do not even recognise. I have read in one book that a state of gratitude is the door to which all of the other beautiful aspects of consciousness begin to flower. When we project gratitude and thankfulness from the core of our being we are powerfully affirming and raising the value of our life and every life we contact with. 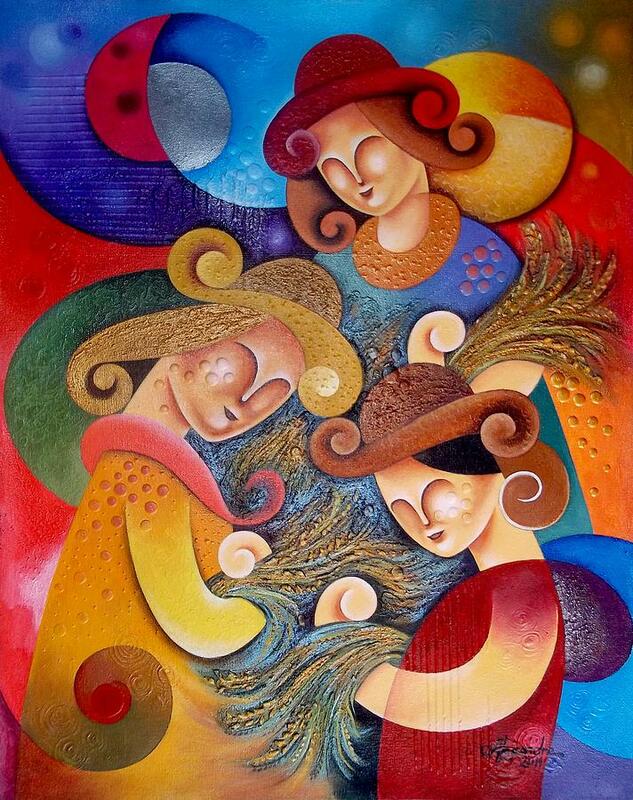 Just three minutes in a day for gratitude three sisters on the painting “Rice Harvest” by Hermel Alejandre ask to open the gate to Miracle we recognise. Heart’s beating and opening your eyes. Say “Thank You” for awakening! She is in sweet November si minor. Say “Thank You” for this day! Say “Thank You” for your calm night! I think Edvard Grieg in the first piece of his “Peer Gynt” suite shares his gratitude in the perfect way. Thank You for sharing Your Light and Happy Thanksgiving! Thank You for your Light, you make the Universe sparkle! Happy Thanksgiving! Powerful triad… I love your poem and the way you related them to light and positive vibes (the greek triad of Goddesses are sometimes dark indeed). Thank you, Aquileana. I suppose as a women we can understand Goddeses – we all can be positive and dark at the same time :-). Happy Thanksgiving! Merry Christmas and Happy New Year! With the best wishes for 2015! A beautiful message in this post and yes gratitude makes our minds peaceful and content. The video clipping to is peaceful and refreshing. Beautiful and heartfelt. Something happened and I lost “following” you. I wanted to link you to my post tomorrow about Svetlana’s art, and couldn’t find you. I’m so glad you are still here, sharing your glory and your insight! Oh, my beautiful Goddess Claudia, Merry Christmas and Happy New Year! May your heart is fullfiled with your sparkling optimism! Best wishes! Hugs with smiles you! It is wonderful to have you back here, creating magic in your unique way. I have been meditating on gratitude lately and have called it radical gratitude, meaning to really savor all that we are given, especially that which has been overlooked. Your poem is a great example of radical gratitude practice. Dear Brenda, Merry Christmas and Happy New Year! May the flower of your gifts blossom and all your dreams come true! Hug! Thanks! What a lovely wish for me, and I hope all your dreams come true, too. Happy Holidays! A amazing storyteller. Please read and enjoy. Thank you Maxima! Merry Christmas and Happy New Year! May all your dreams come true! Hugs. It’s funny — I listen Anita’s Dance all the time; in tracking down the Peer Gynt music I find it’s the name of a play. I have heard a lot of the music from it as well, and not known it.You always open so many new doors for me. I can never wait until the next adventure. You are the perfect travel companion. Love it! Thanks! Very soothing! Thanks! We tend to forget how we are all connected! It’s as beautiful as in years past. Wishing you blessings today and every day! My Dear Goddess! Thank you for supporting me in any time in any season. Claudia, I hug you with warmness and Love. Happy now and happy today!